I could have never imaged how many times I had to apologize in my life. And most of those apologies were for to my mom. Maybe because she’s the only person in the world who’ll always forgive whatever I do. But it doesn’t give me a right to hurt her over and over again. Unfortunately, I got in the same situation recently. I said words I wish I could take back. At that moment I made a promise to myself: never take out my anger on her again. Therefore, I decided to write about do’s and don’ts of apologizing to Mom. 1) Check your intention. Before saying sorry to your mom, make sure that you have a true desire to ask for forgiveness. If you’re going to make it without any sincere then don’t do it at all. Mothers always feel if it seems to be fake. Try to wait for some more time checking your fault out. Maybe then you’ll be ready for saying ‘I’m sorry’. 2) Pick the right moment. If you see that your Mom’s in a bad mood – wait a little longer. Sometimes moms need to stay alone in order to recover from a blow. Remember, that they don’t have nerves of steel and just like everyone they can stay upset for a great while. 3) Do it in person. To build strong relationships you need to extend respect and attention to people. Show your Mom that you care about her feelings and want to apologize face to face. In such a manner she’ll see your perception of the necessity to change. 4) If it’s really hard for you – write a letter. Sometimes we’re hard put to apologize in private. But you can’t escape facing with your guilt. Therefore, only when you’re in such circumstances – make your apologies differently. For example, pick the best sorry poem and start your apology letter with it. 5) Start with ‘I’m sorry’. It’d be better if you initially verbalize your apology. Here I mean that you should begin with sorry words rather than with crying or other ways to start your apology speech. Tell your Mom that you deeply regret of delivering a lot of troubles. Then you can cross over to make a sad face. 6) Admit your guilt. Make her sure that you realize how badly you acted last time. Your Mom want nothing more than to make you notice your errors and to pay them due cognizance. 7) Accept a responsibility. It doesn’t look complete when you admit guilt without being accountable for it. Whatever the consequences could be, make sure your Mom that you are a big boy\girl now and you can be responsible for your actions. 8) Describe your motive. If you have something to say for yourself – tell her, but don’t turn your apology into excuse. Perhaps, the real motive of your actions remains unclear for her. That’s why you should elucidate the matter of a problem. 9) Focus on regret. Whatever motive moved you, ultimately you hurt your Mom and here you should point up the importance of being regret. 10) Offer a repair. ‘What can I do to make you feel better?’, ‘what should I do to undo the hurt I caused?’, ‘how could I atone for your offense, Mom?’ – there are a mass of ways to show a keen interest in repairing a damage. 11) Make a promise. Of course, nobody sure that they will not repeat the same mistakes in future. But you can assure your Mom and promise yourself to try not to do it again. 12) Listen to her. Believe me, your apology speech won’t be exactly the way you planned it to be. Your Mom will surely have some notes to make. This way I recommend you to be all ears. 13) Agree with her. Moreover, listening carefully isn’t enough to make your Mom see that you understand the point. If you share her opinion – agree with it. If vice versa – don’t do it just to make her leave you alone. 14) Hug your Mom. The best way to conciliate with someone is to make a sincere hug. 15) Help her with housework. She’d be pleased if you show a right spirit of being a careful child. 1) Don’t be insincere. Let’s be honest, many of us make apology for the sake of appearance. Even without paying due attention to this, we compromise in order to feel comfortable at long last. But your mother deserves to be that woman with whom you should make terms true to your conscience. 2) If she doesn’t want to listen to you – let it be. Give your Mom some time to make up her mind. Don’t forget that the role of heartbreaker is played by you. She’s harmed. That’s why she has all the rights to feel aggravated as long as she wants. 3) Don’t say you hate her. Sometimes our emotions are out of control. And you can talk a lot of trash while being angry. Calm down and only then start your sorry speech. This way you’ll have more patience and so more chances to change the situation for the better. 4) Don’t compliment her. Desiring to be forgiven people go to fakeness even on the subconscious level. Fortunately, some of our mind tricks we can control. So, don’t let the fear to overreach you. 5) Never interrupt. Once you try to cut in with a little short remark – don’t hope to succeed in a whole dialogue. Show your absolute interest in reaching common ground. 6) Don’t do it again. It stands to reason that no one is proof against making mistakes. But experience is given for avoiding those things we’ve tested once. Someone learns from the mistakes of others. Someone – from own. Whatever be the error you must detect it anyway. 7) Don’t cry when she’s trying to explain you something, but don’t hide your tears when you feel really upset. 8) Don’t make an excuse. Take the blame upon oneself without looking for a justification. Getaways are for fancy pants. 9) Never use If and But. Feel the difference: ‘Sorry if I hurt you’ and ‘forgive me for receiving you a mass of troubles’, ‘I want to apologize, but you could also do it’ and ‘I want to apologize because I feel guilty’. 10) Don’t tell that you’re going to change your behavior and fail your word. Never give a fake promise. 11) Don’t manipulate her. No secret Moms easy come under manipulation on the part of their children. But if she exposes your true intentions, you’ll never regain her trust again. 12) Don’t try to show your indifference. Ultimately, you are that person who should be concerned with gaining understanding. 13) Never make it through the Facebook. Even if your Mom is a hopeless user of social medias – don’t even think to apologize in such a way. You put a slight on her and she’ll conclude that you have light inventions. 14) Never implore quarter. If your Mom decides to punish you – raise to the challenge with a head held high. 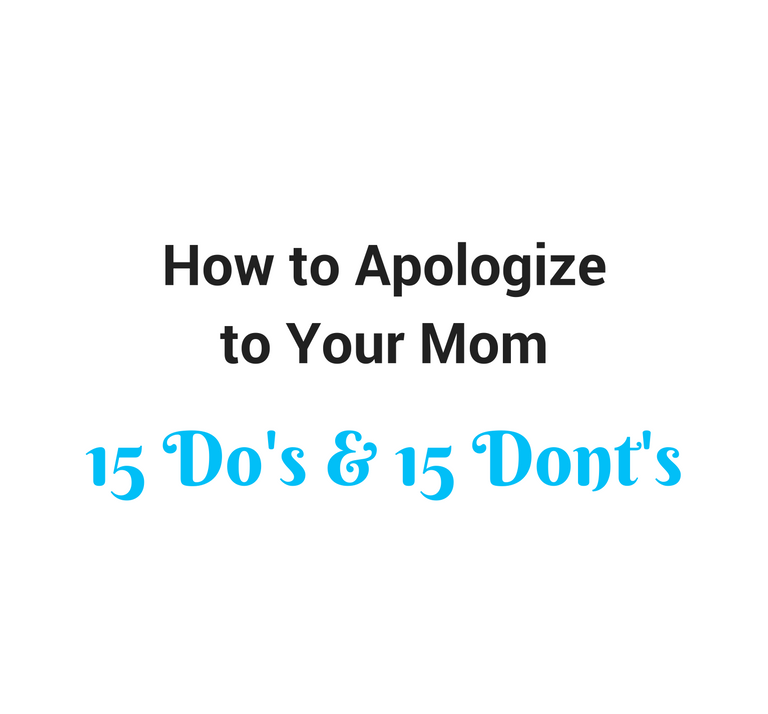 Well, I hope my article help you with highlighting key points in apologizing to Mom. If you have some important tips to make – please, feel free in comments. I’m always looking for feedback from you!